For this page, we need to find out the purpose of Google Talk Video. In other words, what does this application do? Google talk video has many purposes but mainly they are to enhance the communication with a variety of people throughout many different countries. Essentially space is no longer a barrier for communication when you can use Google talk video. The main target audience is....EVERYONE! There is no one person that this application is targeted towards. In fact the more people that use it the more useful the application becomes because it was geared towards making communication easier no matter where a person was located. Language and space have no place within a video chat so no matter what a person can communicate with anyone they want to! A buddy can paste a URL from a Google video session and send it to their friends as well as any picture. A buddy can also insert a YouTube video in to their video chat while chatting with a buddy. 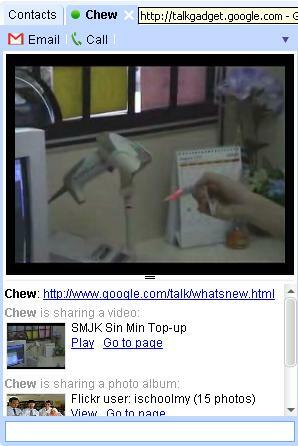 Google Talk Video also supports Flickr slideshows while chatting with a buddy. (INSERT THIS PICTURE: http://ischool.tv/googleapps/files/2007/04/gtalk-youtube01.jpg) Caption: This is a YouTube video that has been inserted in to a video chat. Google Talk Video was developed in order to create an easier form of communication with audio and visible ways of speaking to someone that is a gmail user. Space is no longer a problem with Video chatting abilities. Could you add some more content to this? You could talk about the target audience, and please put it into paragraph form instead of listing the information.